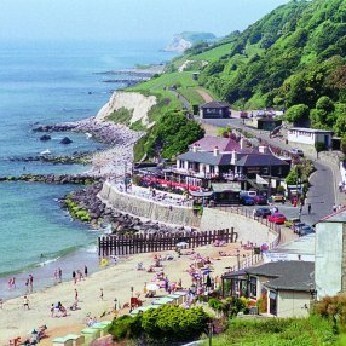 A world famous award winning pub in a unique location in the ever popular seaside resort of Ventnor, Isle of Wight. Great food, wine and beer all day long. The pub is one of the iconic buildings of Ventnor and has a reputation that is founded on good grub, great beer and a fantastic atmosphere. This is enhanced by the live music which is presented free of charge most evenings as well as lunchtime on Sundays and features many of the Isle of Wight's top local musicians. As you might imagine, being so close to the water's edge, seafood is a speciality at the Spyglass with fresh crab and lobster delivered straight to door from the Ventnor Haven fishery. The Spyglass Admiral's Platter is the stuff of legend! As you approach the Spyglass Inn, with its superb terrace, you can’t help but be impressed by its wonderful location. For centuries Ventnor Bay has been the haunt of smugglers with contraband being carried over from the French coast only a few hours sail away. The spirit of those days are captured on the walls of the pub, which are loaded with facinating maritime pictures and artifacts and create a unique and memorable experience. And of course it was the Spyglass that pioneered its own distinct admissions policy, that is now (thankfully) echoed by other proper pubs up-and-down the country. Songs of the Sea is back for 2015! Don't forget about our self catering apartments here at The Spyglass Inn - the perfect place to stay when you are enjoying yourself so much that you dont want to leave!